The Community Learning Center’s Holly Haggerty helps people of all ages to learn how to learn. Holly Haggerty arrived at her work one morning 14 years ago and found herself face to face with a large stranger who had a wide smile and big biceps. He was standing in front of the red door of the old Clearwater Community Learning Center, in one of the tougher parts of town. “She probably thought I was going to mug her,” he jokes now. The man was Tyrone Booze, a retired boxer, and he was waiting for the help that he had needed for most of his life. Booze had lived for decades without the ability to read beyond the fourth grade. 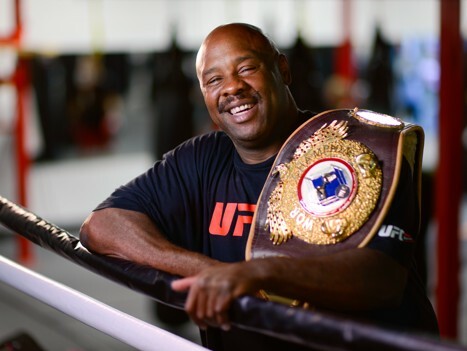 Haggerty, executive director of the center, learned that Booze had spent years fighting Evander Holyfield and other champions, and could not even read the contracts that laid out the terms of his quest for the World Boxing Organization championship. “He could not read the newspaper,” recalls Haggerty, a Scientologist who resides in Clearwater. Funded by donations, grants and fees, the Community Learning Center offers one-on-one tutoring in all academic subjects, and English as a second language to students of all ages. One night in June, for instance, several kids filed into the center’s bookshelf-lined classrooms. Sharon Hillstead, director of tutoring, coached Ricky, an 11-year-old heading into the fifth grade with third-grade reading skills. “GUYANT…” Ricky said as he tried to read a word. “Good!” said Sharon, beaming at the boy. At the Community Learning Center, one of the key instructional elements used is phonics, a method that involves connecting the sounds of letters into words. (Alternative methods are called “whole-word recognition” and “whole language.”) A national panel of experts, studying the best way to teach children to read, concluded in April 2000 that programs providing systematic phonics instruction achieve superior results. The Community Learning Center applies the findings of the National Reading Panel. Says Hillstead, who is also a former public school teacher and author of the upcoming book When Teachers Can’t Teach: “The problem is that many public schools across the country haven’t adopted the findings of the panel’s report.” And literacy rates in America are still languishing. For instance, in 2014 a little over half (57 percent) of Florida third-grade students scored at passing levels on the state’s standardized exam in reading. Retired boxer Tyrone Booze attributes his literacy skills to the study methods taught at the center. Ricky looks up the meaning of the word in a dictionary on the desk where they’re sitting. “It’s a smaller room off of a larger one,” he replies. Despite the remarkable progress that can be seen in programs like those offered at the Community Learning Center, Florida has the third-lowest adult literacy level in the United States, according to the most recent National Center for Education statistics. The Community Learning Center bases its instructional approach on the secular technology of study developed by L. Ron Hubbard. These methods include techniques for monitoring a child’s study so that he fully grasps his materials and can apply them before moving on to the next step. And so is Tyrone Booze, the retired boxer, who reads the local paper every day now—as well as Time magazine. He spent an hour or two a day for a year at the center learning how to read. “I went there faithfully every day,” recalls the 55-year-old.